This has to be my all time favorite movie....EVER! I think it's more because of the memories, then the actual movie itself. It was years ago when I was fourteen. My mom and her best friend Cathy decided to take their two daughters (Jennifer and I) to see The Rocky Horror Picture Show. Now this is NOT a child's movie, but our mom's were COOL like that. The movie only played at midnight, so off we went to the midnight showing. In case you have no clue what the "big hype" about this movie is, I'll explain it's FUN-NESS. It's an audience participation movie. I wanted to go the minute mom told me I could throw rice at the wedding scene.....Really mom, throw rice? Oh, I was so there! So off we went to get supplies for the movie. We needed rice, newspaper, lighter, water gun, party blowers, and a few other things. We arrived and waited in line. There were people dressed up as the movie characters waiting outside. This was about the most exciting thing that I ever went to.....I lived a dull life....hey, I was fourteen. After waiting in a very long line, we found seats (no back row for us) and waited for the movie to start. Apparently the back row was the x-rated row.....we didn't ask. The movie began and LET THERE BE LIPS......I loved the red lips singing. Then the group of people dressed as the characters were on the stage under the screen playing the movie. They acted out the entire move! They shouted out different things all throughout the movie, like name calling Janet, among other things. For a teenager it was the "coolest" thing we ever went to. .....oh how I love the time warp. After the move was over, we were wet from the rain and full of rice from the wedding. SERIOUSLY we had rice in our bras, pants, you name it. YES, there was that much rice being thrown. It's now many, many years later and I still love The Rocky Horror Picture Show. It will always be one of my favorites and will always be a great memory of my mother and I. 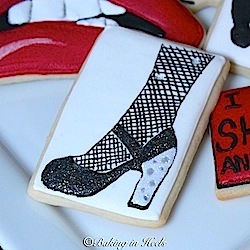 Have you seen The Rocky Horror Picture Show? What's you're favorite scene or quote? Favorite character? If you haven't been to see this movie, I insist you go see it.....NOT at home on DVD but in the THEATRE as it's meant to be watched. Oh and before I forget......I'll be having a giveaway soon to celebrate reaching 200 likes on facebook. 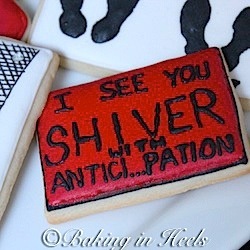 Be sure to follow my blog so you don't miss any updates or great cookies like these. Gizzy! These are the coolest cookies ever! You have yet to make a cookie that I didn't like! Once again, your talent just amazes me every day! I want you to know that you are very loved and such a dear friend! 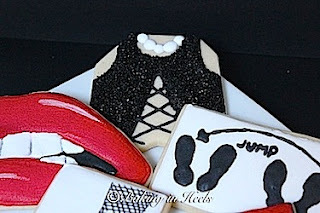 You are my cookie fashionista hero! Love ya lots, your df, Lana! 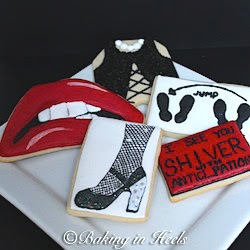 I haven't ever seen it, but your fabulous cookies make me want to. So fun! Love the lips and the fishnets. True food art! Sister, you are the BEST! But hey... How come I didn't get to go with yall to see the Rocky horror picture show> Thats unfair!! @Sister.....I don't have a clue why mom didn't bring you. I don't even know where the heck you were. I remember going like it was yesterday, but no sister.....maybe you were by Ricky's house. Rocky Horror is my all time favorite movie!! I have seen it so many times I can almost recite the entire thing! I worked in a movie theater when it was the midnight show...what fun for a teenager! 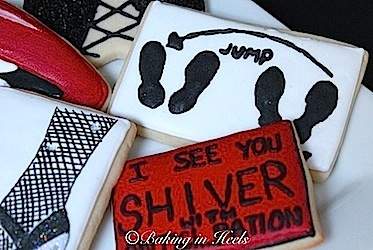 Love the cookie tribute!